Last week we released MaxButtons and MaxButtons Pro versions 6.5 which include our beautiful new color picker! 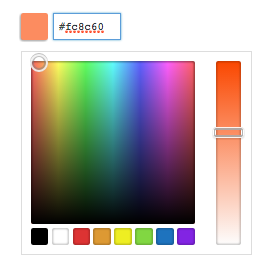 There are number of things about this color picker we love. First is that the color hex code is automatically highlighted so that it is very easy to copy/paste into hover and other button states. The sliding bar on the right is simple to drag and drop as is the circular color selector. Also the most used colors are just a click away in the 8 presets. When you make a new button the option for having a Background Gradient is turned off which eliminates the need to copy/paste the starting background color to the ending background color if you do not need it. Seemingly small changes like our color picker and the settings for the Background Gradient button can make big differences in productivity when using MaxButtons Pro.